A few days ago, we went to my brother and soon-to-be sister-in-law’s house for an afternoon of playtime with the kiddos, great conversation….and of course food. My brother called a few days beforehand and asked, “You’re eating chicken these days, right?” (because of my weeks on a liquid diet and other strange habits due to misbehaving intestines). I responded with an excited YES! Little did I know we were going to have fried chicken. The last time I had fried chicken I was probably 8, no joke. However, both his chipotle glaze and extra-fire-make-your-eyes-water-and-your brow-sweat spicy wings were incredible. I can’t wait for more. 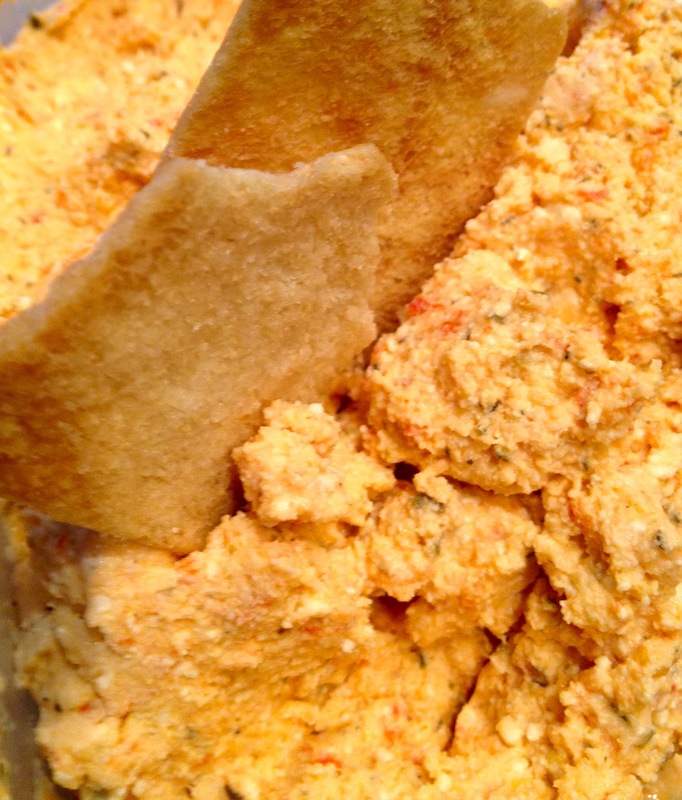 To accompany the wings, I made The Best Dip Ever and this roasted red pepper dip with feta and ricotta. The red pepper dip had the perfect amount of creaminess and spice–not too cheesy or creamy, and not too spicy. It was like Baby Bear’s porridge–just right. Serve it with sliced peppers, celery, broccoli, pita chips, carrots….basically any dipping vessel will be delicious. It is perfect for football parties, as an appetizer for a classy get together with friends or coworkers, or great spread in a pita with some lettuce for an easy (and appetizing) mid-week lunch. It will make many repeat appearances in this kitchen and I hope it does yours too. Using a food processor, pulse the feta, ricotta, garlic, oil (if you use any), lemon juice, herbs and crushed red pepper together until smooth. Throw in the diced red pepper and blend until your preferred consistency.